When Wayne Parks decided to try out for University of New Haven’s football team last year, he didn't expect the coach to let him. Parks had been the captain of his high school team in Fairfield, sure, but that was in 1983. Now he's 45 and even his children are old enough to play for the team. “I don’t get scared much, but it was a little uncomfortable walking in,” he said. 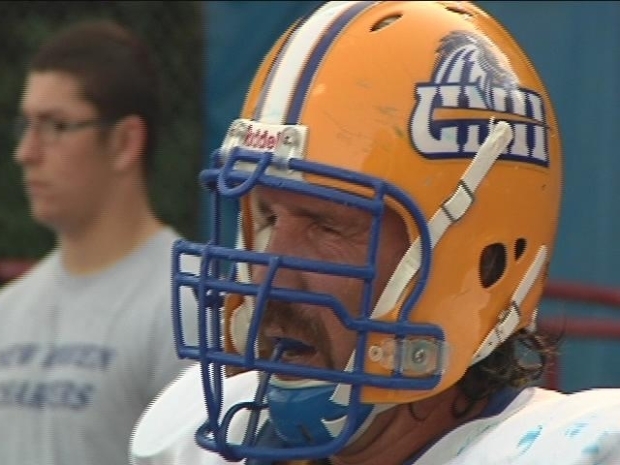 So, after a 26-year break from the gridiron, the former Andrew Warde football captain tried out. He made it, securing a spot as an offensive lineman. Wayne Parks has only appeared in two games for the University of New Haven football team over the past two seasons, but that does not mean he is not an important and respected member of the team. Parks was a captain of his high school team in Fairfield, but when he showed up two years ago to try and make the Chargers as a walk-on, everyone was surprised. Park, a firefighter and married dad of three children, is attending the university to purse a degree in arson investigation. The degree, he said, helps him do his job better. When he retires or moves on to something else, it will help him further his career in his twilight years. Football, however, is a passion. He decided to play because he can and because he loves the sport, he said. Playing again is like riding a bike, Parks said. “To use an old cliche, not that there is anything wrong with old clichés,” Parks said, smiling. At first, Parks’ teammates were not sure how to respond to a man so much older, but now, he’s an honored part of the group and motivates the others. Even though he’s 10 years older than the coach, he’s treated like everyone else. “In the locker room and on the field, I am one of the guys," he said. "I get yelled at the same, made fun of the same. Nothing is different, On this team, we are all the same." Of course, there are some concessions for the working dad and firefighter. There are times Parks has to leave practice early, which Rossomando agrees to because Parks has proven that he is committed to the team.